No other quick reference comes close to providing this much accurate, timely, and clinically useful diagnostic and therapeutic information. 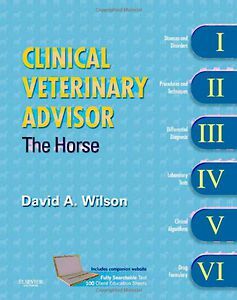 Clinical Veterinary Advisor: The Horse is six books in one -- Diseases and Disorders, Procedures and Techniques, Differential Diagnosis, Laboratory Tests, Clinical Algorithms, and a Drug Formulary. Plus, a companion website gives you convenient, searchable access to the full text and other useful tools. 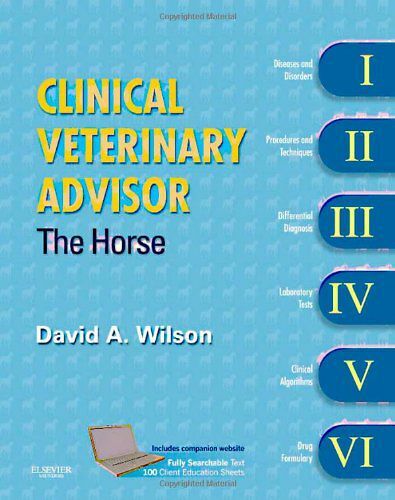 Covering hundreds of current topics in a concise at-a-glance format, this authoritative resource from David A. Wilson, DVM and a group of respected contributors is a must-have guide for the busy equine or mixed-practice practitioner. * A consistent, easy-reference format allows for quick retrieval of practical, clinical information. * A wealth of high-quality illustrations clearly demonstrates key concepts and procedures. o Section I: Diseases and Disorders provides at-a-glance coverage of nearly 500 common medical problems, arranged alphabetically for immediate access. Each entry presents the topic in the sequence it follows clinically, including: history and physical exam findings, diagnostic testing, treatment (including specific medications and dosages), prognosis, and recommended monitoring. References for each topic support the data presented. o Section II: Procedures and Techniques offers illustrated, step-by-step instructions for understanding and performing over 100 important clinical procedures. o Section III: Differential Diagnosis displays nearly every possible cause for 65 different clinical disorders. o Section IV: Laboratory Tests summarizes essential information needed for interpreting 110 laboratory tests. o Section V: Clinical Algorithms provides easy-to-follow, step-by-step guidance to clinical assessment and treatment planning for 50 of the most common clinical conditions/disorders. o Section VI: Drug Formulary is a compilation of dosages and other relevant information by expert Nathan Slovis, DVM for 145 new and current medications. * A companion website includes the complete text of the book in a fully searchable format, which allows quick access to any topic and its related information in the six different sections. The website also includes a searchable drug formulary, a color image collection, clinical algorithms, and 50 customizable client education sheets available in both English and Spanish.